This sleek, eye catching Lancaster Table & Seating 31" chrome tray stand is an attractive addition to your trendy restaurant, hospitable hotel, or convenient road side motel! It has a sparkling chrome finish that provides you with a visually stimulating product, and at a tremendously affordable price. 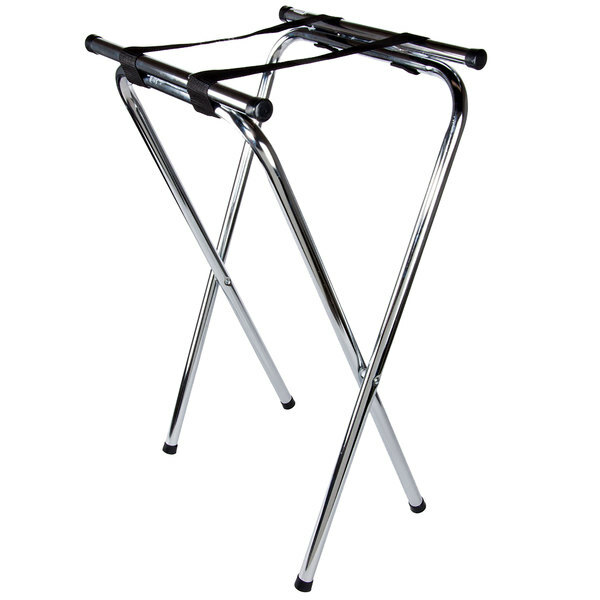 This folding tray stand is bound by sturdy hinges that allow it to close and flip open for the ultimate in space saving storage efficiency. There are two secure, black belts stretching across the top to form a reliable platform for all of your serving trays, while tough black rubber feet provide the unit with additional stability, even on wet surfaces, and protect your floors from scratches. A tremendous option for almost any dining establishment, this restaurant tray stand allows your waiters to quickly and efficiently serve their customers without the fear of spills and other mishaps resulting when dispersing large, heavy orders. It boasts a convenient 31" height that makes it ideal for convenient table side service.